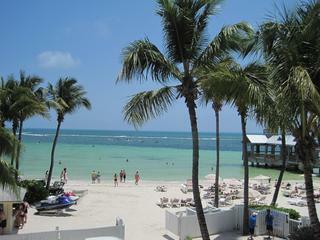 Key West Florida Beachfront Rental, come stay on the beach and feel the off shore breezes blowing thru unit. Watch and listen to the wave's crash gently for a soothing evening backdrop while you sip margaritas!! Views out of magnificent windows offer diamonds dancing on the sea and amazing sunsets and clouds you think you could reach out and touch! See sandy beach, paddle boarders and swimmers with the coco palms waving in the wind. Explore your space in or out of studio watch birds, catch some rays or relax nestled with a good book. Conveniently located in Old Town 3 blocks from Casa Marina resort, Casa Marina district, �walk south just 3 blocks to the Southernmost Point in the USA. This is truly a one of a kind rental with two beaches steps from your door. Please contact the owner for details and any questions to be answered, thank you.